A key strategy to help you improve your overall reading comprehension, reading speed and to build up your vocabulary is being able to work out the meanings of new words from context – context refers to the phrases and words surrounding the word that you do not understand. When you are reading and there is a word you do not know which of the following do you usually do? Click on the one(s) you do below. If you usually do this, it wastes a lot of time and slows down your reading speed. Of course there are times when you need to check in a dictionary such as when you want to check whether your guess is correct or when it is an important word you need to know but you cannot work out its meaning from the context clues. There are times when there is no need to understand the unknown word to be able to follow what the sentence means, so ignoring such words is a good reading strategy. However, just ignoring an important word for the sake of time or effort can hinder the overall comprehension of what you are reading. If you often do this with words that are important for understanding the sentence, then you are already using a good reading strategy. The following activities will help you become better at doing this. To help you work out the meaning of an unknown word you need to be like a detective and use clues to help you guess what the word means. Consider common knowledge and the title as a guide in narrowing down the guesses of unknown words. Ask yourself what the article is going to be about. What do you know about how popular music is made? Look at the unknown word and identify its part of speech. Is it a noun, verb, adjective or adverb? Knowing this information will help you to establish what its role is in the sentence. Look at the sentence to locate any words that signal a relationship between parts of the sentence. Sometimes the relationship is signaled by a linking word such as ‘while, however, but’, which shows a contrast and can help you think logically about the meaning. Look at the previous sentences. The often give information which can be useful in working out the meaning of a word. Use these skills to find the clues and work out the meanings of the unknown words in the text below. Click on the underlined word to check your answers. Write a possible meaning for the word in the table. Check the possible meanings at the end of each part. While many singers rush to adopt the latest software to create tracks that sell millions, recording studios are finding that an older-school hardware approach to music production remains in demand. Rihanna's single Umbrella, which reached number one in the US and UK charts in 2007, is reported to include a loop from Apple's Garageband music creation software, which is freely included in Apple's operating systems. The software contains synthesised instruments, beats and loops which can be mixed and sampled freely. Artists like Courtney Love, Nine Inch Nails and Erasure are also said to have embraced it, offering up their own music to be remixed on it by fans. It describes technology. It’s likely there is a relationship between the word vintage and modern. Break down the word into parts if it is possible e.g. look at its prefix, root and suffix. This will help you to understand the part of speech and possibly its meaning. Look for a definition, explanation, synonym or restatement of the word nearby. Scrapheap A place to throw away old useless things especially metal objects. Abbey Road A recording studio called Abbey Road. Decide if the word is positive, negative or neither. Tim Vine-Lott, technical director at Air Studios, founded by The Beatles' original producer Sir George Martin, confessed that engineers still have a very big soft spot for old fashioned audio tape. 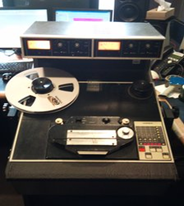 “We have an Ampex ATR 102, a two-track tape machine that people still prefer to mix to. Most engineers will stay completely digital until they want to mix and then throw out to tape," he said. The ATR 102 was discontinued in 1982 but is still treasured by sound engineers around the world. Air Studios, whose clients include George Michael, Radiohead and the Black Eyed Peas, has four of the vintage machines, which would not look out of place on the set of an Austin Powers movie. Look at the previous sentences or the ones after. They often give useful information/clues to help you work out the meaning. "We spend a lot of time scouring the world for spares," admitted Mr Vine-Lott. “Getting tape is awkward. You can buy a hard drive for £100 - you could record 96 tracks on that. Or you can spend £250 on a 10.5in (26.7cm) diameter tape - you get about 15 minutes." It's not just the preferred option of the studio engineers. "Clients like the sound of tape on some things," said Mr Vine-Lott. "Sometimes we bounce off it just to get the tape sound." Musician John Maxwell-Hobbs, musician and former producer/director at The Kitchen studios in New York, believes the appeal of older equipment is that it is so much more tactile than a touch screen or a computer keyboard. "To be able to grab hold of handles or knobs on a mixing desk you don't even have to look at them, you know where they are," he said. "Rewinding a tape, you can physically see how much tape there is left... we are tactiley orientated. "Electronic drum kits still sell because of their physical appeal, he added. "Every music shop has them, it's because it feels good to be bashing at something," he said.